SHANGHAI, Jan. 5, 2019 /PRNewswire/ -CES 2019, the Las Vegas International Consumer Electronics Show, will be held in Las Vegas on January 8, 2019. As a feast of the technology circle, the annual CES gathers the best consumer electronics manufacturers and technology rookies. It is reported that UNRE, a 3D AI technical company that is committed to the development and application of 3D vision technology, will appear at CES 2019 to showcase its 3D AI vision Intelligence technology to consumers around the world. 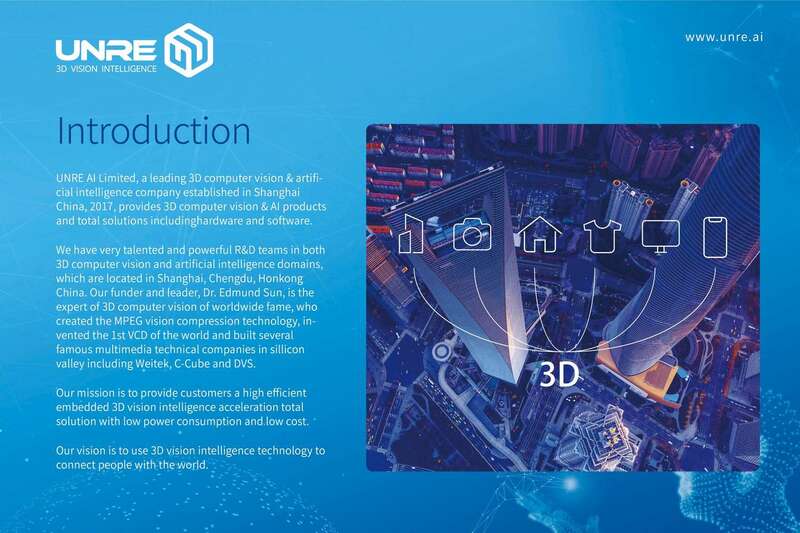 Relying on the vast development space of the Chinese market and a large number of technical and talent support, UNRE not only realized the formation of 3D visual technology algorithms, but also developed advanced commercialized products – 3D AI face processing technology and 4D realtime video broadcasting technology in the past two years. Currently, the company has had a variety of commercialized products, such as 3D high accuracy realtime scanning device, 3D full body 360 degree scanning system, multicamera one-shot 3D face capture system, 3D high accuracy camera module, applied in the industries of medical, security, education and others. This has made UNRE one of the leading 3D Vision Intelligence technical companies in Asia. Recently, UNRE has signed a strategic cooperation agreement with a world leading company (a unicorn company) in beauty industry, and their joint the launching of APP "Like" will be available for download as on January 8, which is believed to make 3D AI Vision Intelligence technology become widely used in daily life. As a representative of 3D AI Vision Intelligence technology, UNRE will entirely participate in this year's CES exhibition. For UNRE, through this global-level event which allows different industries to exchange information and communication with each, it will have positive effect on the future application of 3D artificial intelligence vision technology in various fields.